Where the Bragg's law finds its application? The Bragg's law calculator helps you explore the Bragg's diffraction, a fundamental tool for investigating the structure of a crystal. Read on if you want to learn more about the Bragg's diffraction law and Bragg's equation. In the following text, we also explain how to use the equation and where the Bragg's law finds its application. The electromagnetic waves, like X-rays, are a great tool to learn about the structure of matter. The Bragg's diffraction law shows why. Think about an experiment in which an incident X-ray scatters from atoms in a material. The scattering changes its direction but keeps its frequency intact. The waves scattered from different atoms interfere with each other. Some waves add up constructively, giving intense radiation, some add up destructively. Check the Brewster angle calculator and Snell's law calculator to learn more about the scattered and transmitted waves. Atoms in crystals form regular lattices, and to X-rays, they seem like layers of mirrors. The first mirror is at the surface of the crystal, the second one lattice length deep, and so on. The incident wave reflects from these mirrors. To understand what is going on is enough if we take into account only reflections from the first and second layer. These two reflected waves then interfere. If we vary the scattering angle the result is the diffraction pattern. The maximum happens if the distance traveled by the wave between the first and second layers of atoms and back is proportional to the wavelength. This is the Bragg's diffraction law. Observing the maximum, we can infer then the distance between the atoms. θ [rad] is the angle of the incident X-ray. The order n tells how many times the wavelength λ fits between the double interplanar distance. It is an integer, and its maximal value is (2 * d) / λ. Evaluation of the Bragg's equation is simple with our calculator. For example, let us take an X-ray of wavelength λ = 120 pm. For a crystal with the interplanar distance d = 280 pm we get 4 maxima, cause n must be smaller than (2 * d) / λ = 4.67. The corresponding angles are 12.374°, 25.377°, 40.005°, 59°. We will see the maximum of the diffraction pattern exactly at this angles of the incident X-ray. Scientists use the Bragg's diffraction law to understand the structure of crystals. This and similar methods are called X-ray crystallography. Materials studied with this method range from simple crystals to large biological molecules. The X-ray crystallography was an essential tool in understanding the structure of the DNA. Crystal structure of solids is also investigated using electrons instead of X-rays. Quantum mechanics tells us that electrons are also waves. Their wavelength depends on their momentum through the de Broglie equation. The diffraction of electrons is used, for example, in the Transmission Electron Microscope. 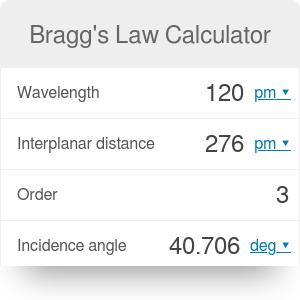 Bragg's Law Calculator can be embedded on your website to enrich the content you wrote and make it easier for your visitors to understand your message.